The first APP & BROWSER EXTENSION that allows you to shorten links on the fly with the best link shorteners that paid. There is a new version (2.11) of URL Multishortener. It does not bring great news in terms of its functionalities, but it does have a new feature that will be useful both for me and for you, the users. Now UMS loads the shorteners from an external database. In this way it is faster and easier to have new shorteners available in the extension. In particular, the shorteners are loaded from the same site as shorteners.net and Lanza.me, which will favor the use of the 3 tools as a whole; what you find in each one will also be available in the others. So far I had to program the functionalities or the existence of each shortener separately and upload the new version, which was slower. Now it's done automatically. The difference with which new shorteners may appear in the mentioned tools will be a maximum of one day. Previously (June 30, 2018) had already been added: UrlCero, Dwindly and U3O. With the new update you will have available: ShrtFly, Uiz.io, ClicksFly, Miniurl, Shortzom and Voxc which counts 4 visits per IP. Note: The new shorteners are only loaded when the extension is restarted or when the browser is reopened. Fixed a problem that eliminated credentials of shorteners when they were added to favorites. The redirects from shink.in before showed two notifications, that now does not happen anymore. In Firefox, adding a shortener in favorites did not show the notification that announced it, it has also been fixed. The panel to enter an alias for shorteners that allow it does not let the accompanying text stand out. The notification shown by shorteners that do not have APIs and that therefore send to the main page when they are selected, has been improved. By mistake he had removed the part of the code that translated the popup texts. Now you can find them in Spanish and not only in English. Now falls of the Internet connection and its recovery are detected. One of the features of UMS is that it makes use of several SkimLinks APIs. Thanks to this automatic affiliation platform, UMS can notify you of the pages where you can earn money with this platform. SkimLinks also has a shortener, and in this way you can shorten the links on these pages to earn money that will go to your SkimLinks account. 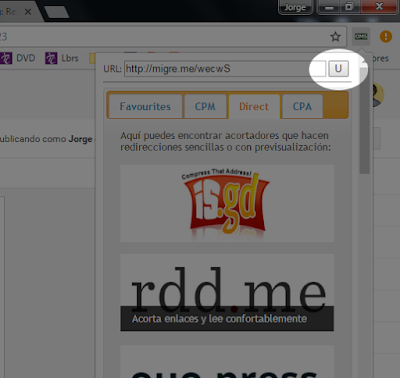 To activate this option you have to open the contextual menu within UMS and activate the option that you will find there. For some time it has been failing to detect the sites of the available advertisers, but this problem has already been solved. This was because the new API of this platform, which was already renewed in previous versions, included a limit of requests that the extension exceeded and caused an error that prevented its correct operation. Now everything works normally; although it takes about 3 minutes to get this functionality since the browser starts. More notifications are added that will make the extension more intuitive and allow you to know, if that is what happens, what is wrong. This will help to know if the problem is the credentials of the API, itself, some parameter or the site in general. This will make it easier to find the solution. Informational: When credentials are deleted, when a shortener is hidden or when you add a shortener to favorites are new notifications that have been added, like other actions in the past. Errors and warnings: In some shorteners (all the most recent ones), when a response is received that is not the expected one: there are several types of errors that can be detected and offer a solution, in addition to many others that will be notified with their message corresponding error. The errors can be returned by the shortening API. They can be of the type "invalid URL", "invalid API token" or "invalid API call". Other errors can be HTTP status codes. In this case the typical 4xx or 5xx If an error of this type is received also, along with a simple description, it will be indicated. Other less likely error messages may also appear, such as problems that may appear internally in the APIs or having chosen one that was not due. When possible the extension will give you extra information to solve this problem. In any case if someone needs to contact me for this reason it would be very useful to specify the error. Note: Pending approval of the latest version, this option may not yet be available in all versions of the extension. Linkrex.net has highest payouts for European countries and pay from a minimum of $ 3 for all. Withdraw from $ 5 via PayPal and Paytm, Bitcoin from $ 20 and Payoneer from $ 50. Short.pe is sending your payments in a matter of minutes and has great rates; from a minimum of $ 3.00 the thousand visits. Payments are sent by Paypal and Payza from $ 5 of balance, as well as Payoneer from $ 50. Won.pe looks great, emphasizes security and without becoming exorbitant, its rates are also great for all countries. Allows adult traffic. Only pay through bank account, from $ 15, and Payoneer, from $ 10. Gold Shorten, registered in October 2017, has a Latin administrator. The CPM starts at $ 2. Send payments by PayPal from as little as $ 1, as well as by Western Union from $ 50. UrlCero.us, whose domain was registered in September 2017, is getting a lot of traffic. Pay over 2 $ thousand visits. Send Paypal payments starting at $ 5. In Link4.me some innovations are present, although unfortunately they do not go beyond the indexable pages. Their rates are very normal. Pay by Paypal from $ 5. Note: Pending approval of the latest version, this shorteners may not yet be available in all versions of the extension. It is now possible to establish the alias or identifier of short links. In this way you can get shortened links more descriptive. All you have to do is, once the extension is open and locate the shortener you want to use, display the options of the shortener with the secondary mouse button and choose "Shorten with aliases". Not all shorteners offer this possibility, but all those who offer it have this option in UMS. A new panel will appear in which you can enter the desired alias. If that alias is not available, the action to be taken depends on the shortener. Some shorteners send the short link with a new random alias, while others throw an error. In the latter case it will be necessary to reuse the option and choose another different alias. There is already a large pile of shorteners. Every day there is more and more and the number of them begins to be considerable. 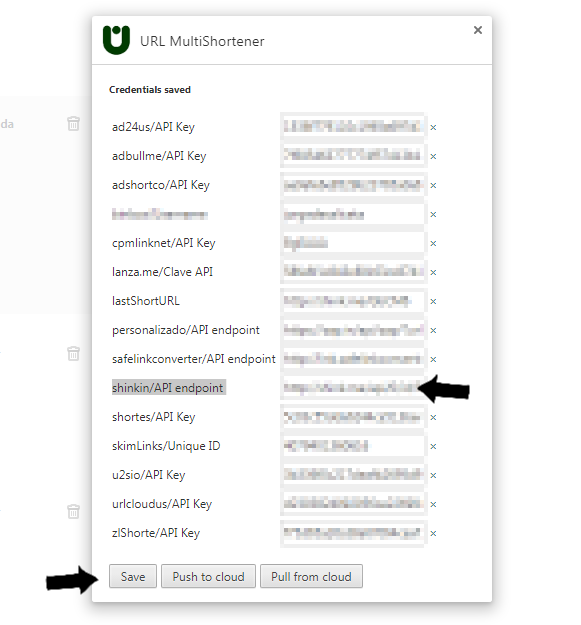 Although there is already a tab to place your favorites shorteners in UMS, now there is a new option to solve this; hide shorteners from the extension. Now you can hide the shorteners that give you the most rage. All you have to do is open the extension, find the shortening and display its contextual menu. Below the menu you will find an option called "Hide shortener". Once used the shortener in question will disappear from the tabs. If you have saved credentials are deleted, they are also removed from favorites if you had them there. If you want to see shorteners that have been hidden again, you can do it from the button that you will find in the configuration of the extension. URL Multishortener is now available with all its improvements in Firefox. Previously the extension in this browser did not come incorporating the most recent improvements that presented for Chrome and Opera. Although it was the first browser for which it was launched, the transition between the browser APIs was not as agile as it should be and many options were not available, so UMS in Firefox was not only without the improvements , but also without many important shorteners. The shortcut menus for all shorteners have also been improved in the extension. Now look better, adapting to the extension environment so that there are no parts that can not be seen (it would be great if these menus were shown with a defined width and out of the main menu of the extension, but for now I could not do this). Tmearn, which has just sent late payments and whose fees are very high and can make you suspect, so I recommend using it through the metazartador of Lanza.me). From a minimum of $ 2.8, payments can be requested at any time from $ 3, via PayPal, Payza, Bitcoin and Payeer. Oke.io, also with some delays in payments, although less accused. it is available in Lanza.me. From a minimum of $ 2.20 (most do it at $ 2.40), we can collect our balance from $ 5 each day through Bitcoin, PayPal, Payza and Skrill. Linclik, of which at the moment I have only received one payment, his payment rates are the same for all countries without exception $ 1.8 per thousand visits, gradually increasing from the initial 1.5. Pay by Paypal or Payza, once the minimum of $ 5 has been reached. Mitly.us, which was increasing its rates progressively until reaching the top of the best paid shorteners. Pays for Spain $3.2 and for the traffic of all the world is paying $2.2 CPM at the time of writing this. I have recently checked that pays, and it does so from just $ 3 via PayPal or Bitcoin. Excuse me (SCAM); Igram.im is an American shortener that is gradually becoming more popular. From a minimum of $ 1.85 CPM to Spain, Latin America, as well as countries not indicated in the tables, send payments from $ 5 via PayPal or WebMoney. I have also checked that pays and the best of all is that it now has up to 7 visits from the same IP every 24 hours. Shink.in suffered a major stumbling block. For some reason its domain was blocked worldwide and it is not possible to access it or the links through it. They have enabled a new one; Shink.me, which works just like the old one. Everything is ready in UMS to return to the routine with this shortener. This change has already been applied in UMS so it is now possible to shorten URLs normally using the new domain. If you have never used Shink.in through UMS you have to do it as with any other shortener; adding the credentials requested. If you were already using it you have to delete the previous credentials and use the new ones. From there you can easily edit the entered credentials, sometimes they are routes and in other codes. With Shink.in you must introduce an API endpoint, that is, a path to a web address, which you can find in your Shink.in panel, under the Tools -> API menu. In addition, it is not necessary to use exclusively the version of the API of Shink.in that returns plain text, but both versions are compatible with the extension. It will now also work with or without the example address that is included in the documentation. As a special extra, there is a new option available in the Shink.in sub-menu in the UMS panel. This allows you to automatically redirect to the new domain when you visit any route of the old one. Keep the original route so the old links you visit will also work. Adshort.co is a fairly recent shortener. His domain was registered on August 24, 2016. However he is becoming very popular for his good services and excellent rates. If you were already generous at the beginning, now they are still more. From a minimum of $ 2,15 increased from $ 1.75, $ 1.65 and $ 1.5 initials to the vast majority of countries, the United States makes $ 5, UK and Canada $ 4 and Spain $ 2.60 per thousand visits. Payments are made on a biweekly basis starting at $5 of balance via Paypal or Payza. Adshort.co is now available in your URL MultiShortener extension. Best regards. 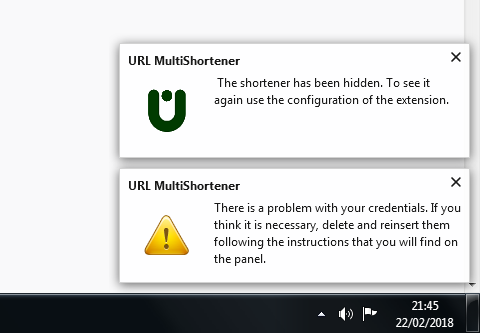 In addition to 3 new shorteners that are sure to give no problems, there are some small improvements that you may not notice in URL MultiShortener. This is a better behavior of the extension, preventing other addresses are shortened that are not desired when there is more than one window open (until now it was possible to open several windows of the extension if we were unfolding them from the context menu of the browser). This is now no longer possible, since UMS closes the previous window when opening a new one, even when the popup is displayed as it is done generally from the button of the extensions bar. Another improvement is that the links obtained in the clipboard no longer include a line break that is sent from the shortener. It is now much easier to keep up with work when links are shortened with the context menu button of the browser, having a URL selected. UrlCloud.us although I really still do not know if it pays, many are recommending it, and is that it is giving a good service for Latin America. Despite having a worldwide price of $ 1.60, it now offers more for most countries in the region. Pay at $ 5, via Paypal. Short.es belongs to the same owner of Short.am so you can practically count on our trust from the beginning. We can both advertise and earn revenue. Among the rates the highest paid countries are the United Kingdom and the United States with 2.5 $ each per thousand. The minimum CPM is $ 1.50. Payments are sent by Paypal once reached the 5 $. Urle.co: with barbaric rates for all countries, starting from a minimum of 2 $ CPM. The highest-paid countries are Australia, the United States, Canada and the United Kingdom, all of them at $ 5.00 per thousand. From just $ 1 we can withdraw our profits via Paypal or WebMoney. They are ready to use on your extension. Best regards! There is a new URL shortener that does not pay but with which you can improve your income that has added to URL MultiShortener. Lanza.me is the last application I've been working on. It is present on UMS and it's a link shortener with many possibilities. Not only can it work as a regular and simple shortener, redirecting visitors immediately to the landing page, but it has other functionalities. We will see them all or almost all. It can shorten addresses of all types, with or without protocol and with multiple special characters and symbols. This includes the signs of admiration among others to make it compatible with the Mega links and everything that is put ahead. Direct, automatic or simple redirections; As it is expected to work a shortener without more functionality but with a barbaric speed; Sending users to landing pages without any delay or other signal. Intermediate pages with external sites. It would be like a full screen ad and we the advertiser. Intermediate pages with a repertoire of referral systems. Where we just have to leave our referral links and whose distribution we can edit. Metashortened: We can use other shorteners to shorten the links and change that shortening in all links with 1 click. The links are saved in your account so you can have them always on hand. You can log in with email accounts or social networks; Twitter and Google+ and once inside associate other accounts for an always simpler login. Service fully scalable so it will always work fast and without interruptions (at the moment not because I'm not paying anything for the hosting). Easy navigation and accessible resources from the main panel. There is a support chat in this main panel in case you want to contact me, although you can use any way. Of course you can create a user account, otherwise other types of links other than the direct link can not be created at the moment. I also call it 'external pages as intermediates' or simply 'external pages' to abbreviate within the application. As in the more classic shorteners we can show our site as if it were an interstitial ad. Above all there is a navbar with a countdown and a button to continue to the landing page. If you always wanted to advertise in the shorteners they pay, this is the opportunity to do it totally free (although logically only in your links and not links of other users). You may not have a preferred external page, or you may have several and you want to display them all together. In that case you can only insert your referral links, set the preferred order and launch. Lanza.me will show your collection, adding images and text for you to try to get multiple referrals in a single visit. At the moment only 4 famous referral programs are included but I hope to add many more as time goes by. I have a good compilation throughout the my blog and many that I never published because they are PTCs (money for click advertising). 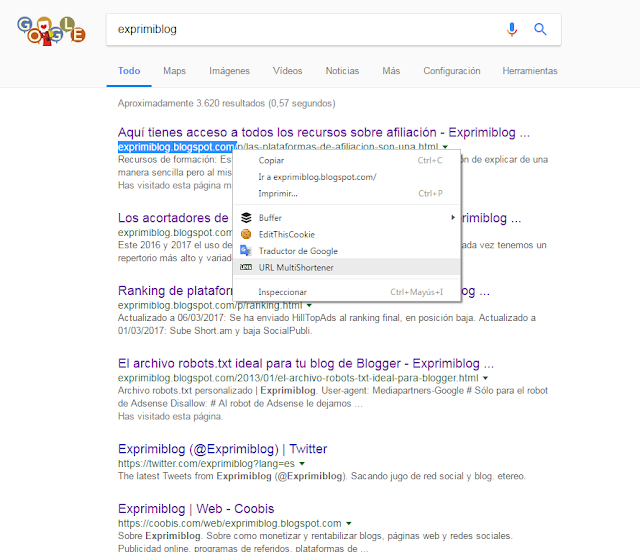 The metashortener is the tool with which we can shorten one or a series of links instantly and with a single click our links with other shorteners. In order to do this it is imperative that the external shortener that we are going to use count among its tools with the 'fast links'. Called Quick Links and Easy Links, you can find them in virtually all the sharers they pay for sharing, within the tool sections. This kind of links are great. They allow us to build remunerated links from addresses without shortening, placing this quick link to the destination address. All this makes it launch me for us automatically and immediately (not even a second), once we have passed the corresponding quick link. 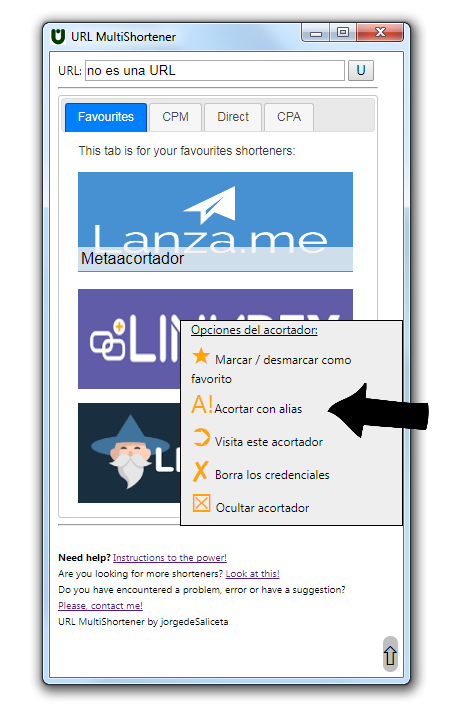 👉 Keep in mind this: You can shorten the links with lanza.me and then meta-shorten them with different shorteners and change them at any time. For now, you can find it on the Direct tab of URL Multishortener. Add statistics or at least visit counters. I am already adding the latter and will soon be available. At the moment, it is only available in spanish. 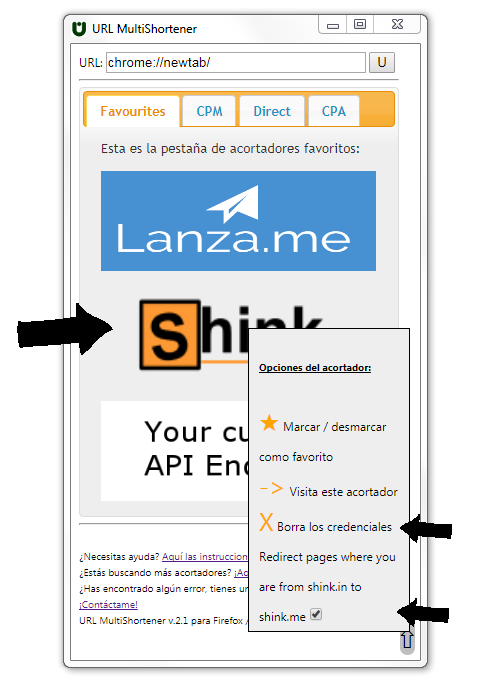 You can contact with me in the lanza.me principal panel, in the chat box. Best regards! Adpop.me has just been added to the extension. From a low balance of only $ 2 you can withdraw your earnings. It shows 2 intermediate pages, the first with captcha, the second with a full screen ad. Payments are sent via Paypal and Web Money from 2$ in the 4 days following the request. zlShorte.net, which pays from a minimum of $ 1.6 for any country in the world. Spain does it to 2.5 $, which is also the maximum that can be obtained according to the rates. Payments are made from $ 5 to the Paypal account. U2S.io (This could have problems) as indicated in rates, the best paid is U.S. with $8 followed by Australia with $5. Rates have recently increased for almost all countries. Those not mentioned in the tables (this includes all Spanish-speaking LATAM) are paid at 1.6$ for 1K visits, Spain makes it at $ 2.10. Pay at $5 for Paypal. Ad24.us (This could have problems) paid for from Australia; $4.40. United Kingdom $4.24, Norway $4.00 and United States at $3.95. Among other countries, Spain appears with $2.10 and after another those of Latin America, all of them quoting to $1.50 without exception. Pays at $ 5 via Paypal. Also it have options to advertise. A couple of errors have also been fixed in the notifications of some shorteners. Surely you have already seen the new shortener; Adbull.me. Their payment rates are extraordinary and is now available in MultiShortener URL. But he does not come alone. 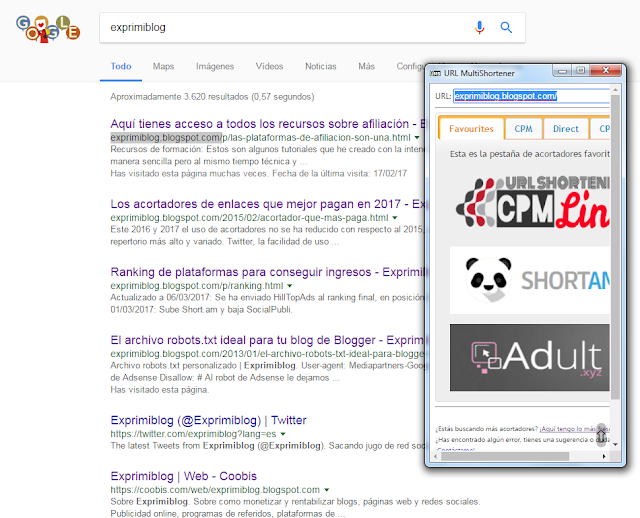 Now there is also a small historial that allows us to retrieve the last short URL obtained, and also inserts it into the text box of the extension to make it easier to camouflage it with simple shorteners. All you have to do is press the button that you will find next to the box for the URL in the extension. If you have not yet shortened URLs since this last update, then it will not work, just wait to shorten some address and the functionality is now available. The extension automatically takes you to the Direct tab. This is because it is not allowed to creating rings of links with similar services, by the conditions of virtually all the shorteners they pay,. 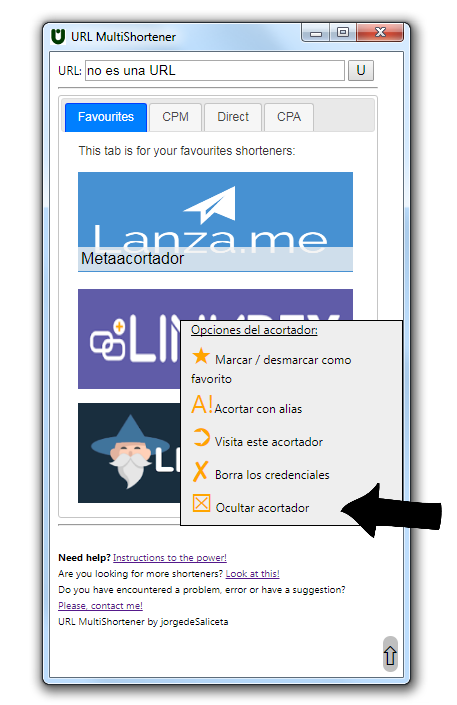 ¡New feature: Short links from text selection! Now is possible to shorten addresses without having to visit them. If you want to shorten a URL that is published in a web and do not want to enter it, just select it with the mouse pointer and click the right mouse button to display the context menu of the browser. There you will find a MultiShortener URL icon, only from there you can use this feature. If it is actually a URL, the selected text will go to the text box of the main panel of the extension, which will be displayed in a new window. From there the operation is as always; You select a shortening and if you already have the credentials entered, the short URL will be passed to your clipboard. 3 new APIs for 3 awesome shorteners and more faster! Adult.xyz (intended for adult traffic) is the same creators of Adfly, and although it is very recent has almost all the advantages of this. All countries are well paid. Spain does it at $ 1.56, Mexico at $ 1.06, Argentina at $ 1.02 per thousand visits (of all LATAM, the lowest quoted is Chile with $ 0.89). You can check the rates in the specific section. CpmLink.net Is European and quite recent. Pay a CPM (cost per mile) from a minimum of $ 1.6 for all countries in the world. This urls shortener sends payments from as little as $ 1 via PayPal or Bitcoin. ¡Awesome! Besides, punctuality in payments is a very remarkable feature of it. Also I added a script that allows to open the extension faster, delaying the loading of the images. Now only the images of the selected tab are loaded, saving load time at the start. It is made with lazysizes. I hope you enjoy them. A greeting to all. Mgcash is a CPA platform affiliation that has some interesting tools to build links. One of them is a URL shortener, whose intermediate pages show one of the offers available for the country of the visit, in full-screen and with a wait of 15 seconds. Some of the offers pay up to $ 75 per conversion. SafeLinkConverter allows us to choose between display ads CPM (cost per thousand) or our Adsense ads. In the latter case distributes 99% of revenues. Rates are skyrocketed; US payouts rates are $16 per thousand views. For Spain, they are $2.18, the minimum LATAM are $ 1.8 thousand visits. Even more shorteners are included; Catly.us, Akorto.eu and Abbg.io. More information and easy API access in extension. The Favorites tab is now dynamic. You can add and remove favorites shorteners this tab and the changes will take effect immediately for both. You do not need to reopen the extension for the changes to take effect. Spanish has been added as an available language. This latest new is fairly important, because now that it has added a second language is much easier to add more. If someone wants to translate it into another language not available, you can contact me. You have all the information in the extension 'Direct' tab. Best regards!